Dear Reader, I'm sorry to say that the book you are holding in your hands is extremely unpleasant. It tells an unhappy tale about three very unlucky children. Even though they are charming and clever, the Baudelaire siblings lead lives filled with misery and woe. From the very first page of this book when the children are at the beach and receive terrible news, continuing on through the entire story, disaster lurks at their heels. One might say they are magnets for misfortune. In this short book alone, the three youngsters encounter a greedy and repulsive villain, itchy clothing, a disastrous fire, a plot to steal their fortune, and cold porridge for breakfast. It is my sad duty to write down these unpleasant tales, but there is nothing stopping you from putting this book down at once and reading something happy, if you prefer that sort of thing. 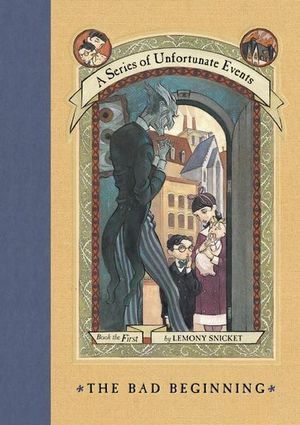 With all due respect, Lemony Snicket.